I misrepresented who Ben Day rides for in yesterday's blog post. Ben Day, of Team Toyota-United, won the Haystack TT yesterday in a time of 32:54 and beat Heath Blackgrove who had a time of 34:02. Chris Baldwin was 3rd with a 34:14. I was 1:27 out of a top five placing with a 35:55. Thanks for the feedback and comments on my last post. Mark asked if my saddle was also moved back since my first time trial of the year. Yes, I did move my saddle back 2cm to become UCI legal (5cm behind the BB). Today's result was not that great for me. I was 15th, about 3 minutes behind the winner Ben Day (Toyota-United) who crushed everybody including several Toyota-United pros, Taylor Phinney, etc. I was about 1:30 out of a top 5 placing (the results are not posted on the web yet). Oh well. At least I don't do this for a living any more. I definitely had bad legs today and am also adapting to the new position. However, my legs were the real problem today. I couldn't maintain my pace the last 15' of the TT. I averaged 340w for the race and only 329w for the last 13'(which was the crucial headwind final stretch). It was a great training day though and will certainly pay off down the road. Here is my race file and you can download it into WKO+ for further analysis. My CP20 was 344w (2nd highest of the year) and my CP30 was 339w. My race time was 35:55. I think Ben day did 32:45- Yowsa! I also used Active Weight Spokes today within a disc cover which Rich Sawaris of WheelBuilder.com pieced together for me this week (Thanks Rich!). Ricj used an FSA wheel which had a 3rd flange so he could have the weights move within the disc without hitting the cover itself. The wheel was great and I'm sure it benefited my time, again it was my form and fitness which held me back today. I also did a team time trial for Vitamin Cottage and I haven't seen the results yet. We chased Toyota-United who did the TTT without any TT equipment since they are preparing for the Tour of GA TTT which does not allow aero equipment this year. 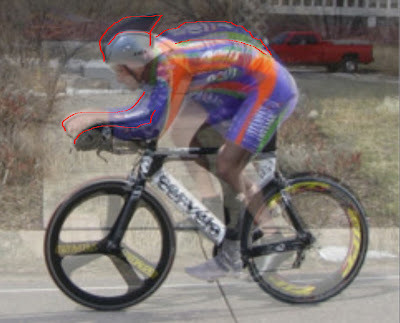 I made some significant changes to my TT position since my first race of the year. 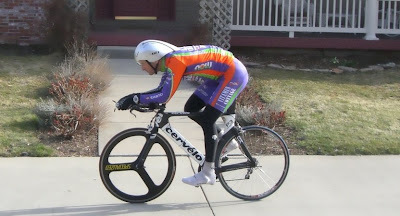 Back in March I was 3rd within a 9 mile TT, just 22 seconds behind Stefano Barberi and 18 seconds behind Justin England. Let's hope these changes below can make up the 2.4 seconds per mile necessary to have beaten those guys. 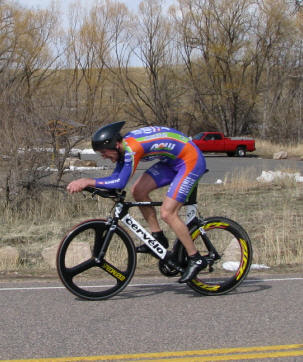 Tomorrow's TT is a 16 mile test north of boulder called the Haystack Mountain Time Trial. I'll be doing both the individual and team time trials.